This is a follow up to an earlier (July 2015) post on ECHO’s 2-4-2 maize/cowpea trial. This update presents some of the data we have collected to date. Legume biomass was sampled 2 July and 5 October 2015. This was done by cutting—at ground level—all of the above-ground shoot biomass within a 0.9 square meter frame (was slightly less than a meter square when measuring the inside edge of the frame) made with PVC pipe. When the legumes were sampled in July, the above-ground biomass of both weeds and legumes were sampled. Weeds made up less than 3% of the biomass in cowpea and jackbean plots. Weed biomass in the mucuna plots was statistically similar to that with cowpea and jackbean. 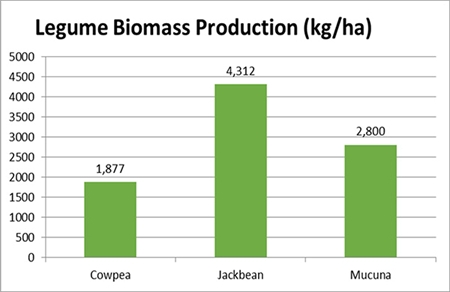 Legume biomass was greater with jackbean (2.9 tonnes per hectare) than cowpea (1.9 tonnes per hectare) and mucuna (1.6 tonnes per hectare). 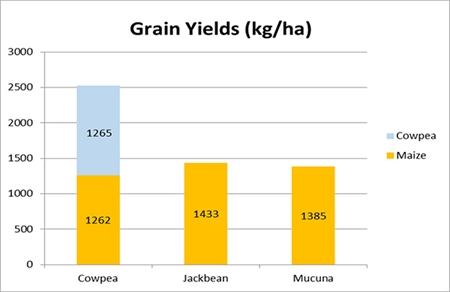 These data show that jackbean and mucuna biomass had increased substantially from July to October. Cowpea vines were already beginning to decline in July, so they were not sampled in October. Notice that the combined cowpea and maize yield reaches 2.5 tonnes per hectare. In late November, a second cowpea crop was planted, which could bring total yields up to or above 3 tonnes per hectare. A yield of 3 tonnes per hectare is comparable to yields obtained by the International Institute of Tropical Agriculture in Nigeria. The yield of maize alone (gold bars) was statistically similar with each of the legumes. Thus, even with high-biomass producing legumes like jackbean and mucuna, any legume competition with the maize crop did not adversely affect maize production. This illustrates the advantage of having maize and legumes in their own blocks of space (4 rows of legume alternating with 2 rows of maize), as opposed to maize being grown in alternating rows with legumes. We did observe mucuna vines climbing maize stalks at maize harvest time, but by then the the cobs had already been filled and the only issue at harvest time was that the maize was a bit more difficult to harvest, as some of the stalks were falling over. Although jackbean produced the most biomass of the three legumes, it did not climb the maize stalks as aggressively as mucuna. In summary, then, the 2-4-2 maize/legume system can work with all three of these legumes (cowpea, jackbean, and mucuna). One just has to keep in mind the pros and cons of each legume. Cowpea is a shorter-term legume that will not generally produce as much biomass as jackbean or mucuna, but it produces a bean that most people are familiar with, and it is very doable to grow two plantings of cowpea in a single season. Jackbean seeds are not considered edible in most areas, but in parts of Asia and elsewhere it is consumed after extra cooking/processing (e.g., longer boiling times). Mucuna beans are not considered edible either; however the vines provide weed suppression and, as with other legumes, contribute significant amounts of organic material and nitrogen to the soil. It would be interesting to try this system with lablab, which we did not try in Florida because it does not grow as well during our hot, rainy summers. Lablab produces an edible bean, which would mature after maize harvest with vines persisting late into the dry season. If you do try this system with these or other legumes, we at ECHO would be interested to hear of your experiences.